The Victor's Place | Some homilies, scattered thoughts, images from the Passionists: : whatever the days bring. Follow me on Twitter @vhoagland. The cross flowers at Easter time. 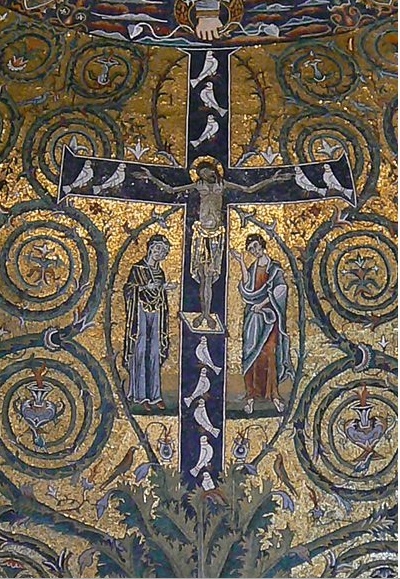 A flowering cross in the great apse of the church of San Clemente in Rome brims with life. It’s a resting place for doves; its branches swirl around the gifts God gives. It brings life, not death, to humanity signified in Mary and the disciple John, to creation itself that draws new life from it. The hand of God makes it so. The mystery of the sacraments offered in this sacred place brings its life-giving graces to us. An early preacher Theodore the Studite praises the mystery of the cross:. “How precious the gift of the cross, how splendid to contemplate! In the cross there is no mingling of good and evil, as in the tree of paradise: it is wholly beautiful to behold and good to taste. The fruit of this tree is not death but life, not darkness but light. This tree does not cast us out of paradise, but opens the way for our return. “This was the tree on which Christ, like a king on a chariot, destroyed the devil, the Lord of death, and freed the human race from his tyranny. This was the tree upon which the Lord, like a brave warrior wounded in his hands, feet and side, healed the wounds of sin that the evil serpent had inflicted on our nature. A tree once caused our death, but now a tree brings life. Once deceived by a tree, we have now repelled the cunning serpent by a tree. This entry was posted in Religion and tagged Cross, death and resurrection, Easer Tree, Passionists, Patricia Tryon, San Clemente on April 20, 2019 by vhoagland. The Passion of Jesus is not only a human story; creation takes part in it too. At his death “the earth quaked, rocks were split” Matthew’s gospel says. (Matthew 27,51) “From noon onwards darkness came over the whole land till three in the afternoon,” Matthew, Mark and Luke tell us. The sun that rules the day, the moon that rules the night respond as Jesus cries out in a loud voice and gives up his spirit. Artists through the centuries place sun and moon at the cross of Jesus. Remember too those great elemental realities blood and water, which John’s gospel says flowed from the side of Christ when a soldier pierced his side. Water refreshed with its contact with the Word of God; blood source of life for living creatures come from the side of Jesus. They also share in the mystery of redemption. Artists from the eastern Christian traditon see the Passion of Jesus leading to a great redemption. Jesus does not rise alone, but humanity and creation itself will follow him. This entry was posted in contemplation, easter, Inspiration, Lent, lenten homilies, Motivational, Passionists, spirituality and tagged blood and water, creation, Holy Saturday, Tenebrae on April 20, 2019 by vhoagland. This entry was posted in art, Inspiration, Lent, Motivational, Religion and tagged crucifixion., Passion of Christ, Rembrandt on April 19, 2019 by vhoagland. This entry was posted in Lent, lenten homilies, Motivational, Passionists, Religion and tagged Cross of Jesus, Good Friday, Good Friday homily, John's Gospel of the Passion on April 19, 2019 by vhoagland. Tenebrae for Good Friday begins with a reflective reading of Psalm 22, which is quoted 13 times in the gospel stories of the Passion of Jesus. The psalm reveals someone in the midst of hard suffering, yet with no bitterness, no complaints of injustice, no lashing out against an enemy. It reveals Jesus in his Passion to us. “We meet a simple abandonment into the hands of God, and in this surrender there is peace. The psalmist asks so little of God; only that God hear his cry of abandonment. (v.2) Once God induces a mystic presence so that the psalmist can whisper ‘You heard me’ (v 21) the psalm modulates into a song of Thanksgiving. What are “the good things that have come to be? ” Even on Calvary we see them. Blood and water flow from his side as the soldier pierces him with a lance. Blood and water are universal signs of life. Humans need both to live. In our final reading for Tenebrae, Saint John Chrysostom sees in them Christ fashioning his church as Eve was fashioned from Adam’s side as he slept a deep sleep. Blood and water are signs of Christ’s gift of life to us and his life-giving sacraments. More than whips and thorns and nails, good things come about on Calvary. Jesus give us life here, life that conquers darkness and death. This entry was posted in Religion on April 19, 2019 by vhoagland. This entry was posted in Inspiration, Lent, lenten homilies, Motivational on April 18, 2019 by vhoagland. This entry was posted in Religion on April 17, 2019 by vhoagland.